Back in the days when PCB making was expensive I started to look at ways to do that on my own. There were basically two: photo lithography and etching or milling. I did not like the idea of having to handle the nasty chemicals for etching so I first decided to get myself a CNC milling machine. Later on I found that milling had other issues so I stopped that and did invest in a small etching setup and so the CNC mill started to collect dust in a corner. This was about 2004. 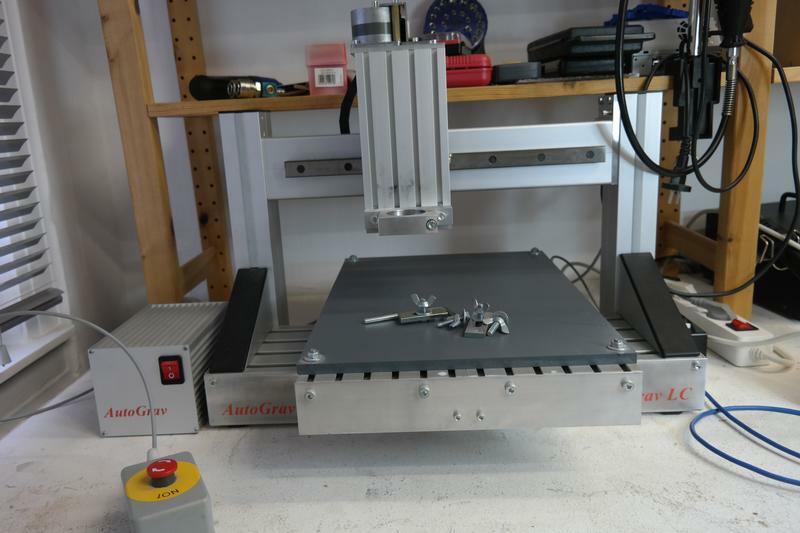 Now, about 14 years later, in the days of the maker movement, 3D printing and a much much better free software ecosystem to work with machines I decided to blow new life into my old CNC mill. That’s the machine! The original software drove the whole thing through a PC’s parallel port, which today no PC has anymore. And it was a set of MS-DOS programs directly accessing the PCs I/O ports, so no way to get this running on modern operating systems anymore – neither would I want to. So first of all I needed to find out how this parallel port interface worked. It turned out to be pretty straight forward. The three stepper motors (X, Y & Z) are controlled by two signals each: direction and step. 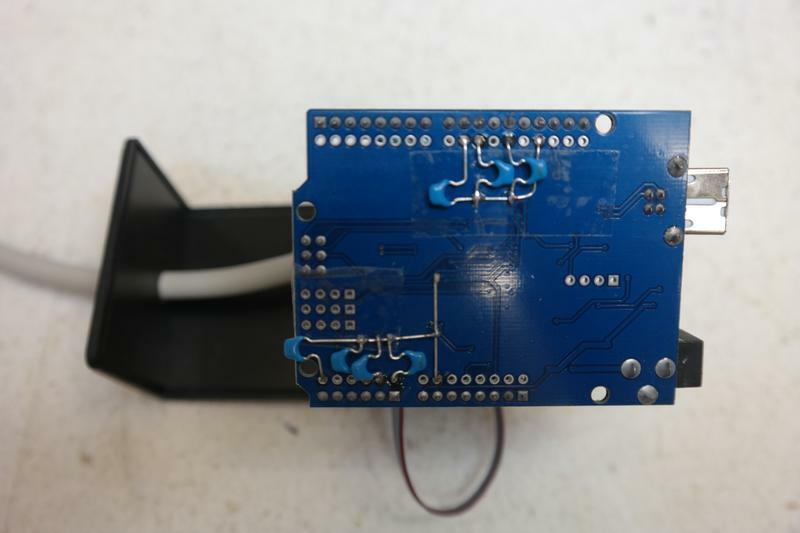 The rest is handled by a stepper motor driver embedded in the machine. This makes control pretty easy! Then there are a bunch of switches – end stop switches for each axis, an emergency stop switch (the box to the front left on the photo above), a general purpose sensor and a length sensor. And there are two additional actuators, one controlling a relais for enabling the milling motor and a relais for enabling an optional cooling device (like a cooling liquid pump). Pretty easy, isn’t it? Next question was, how do I control this from a PC? Since this has been a side project I just occasionally looked for solutions, from time to time and without much energy. It turns out that my reluctance became bliss 🙂 With the rise of the maker communities a lot of stuff has been developed for low cost machine control interfaces. So at some point I found GRBL which is exactly what I needed! 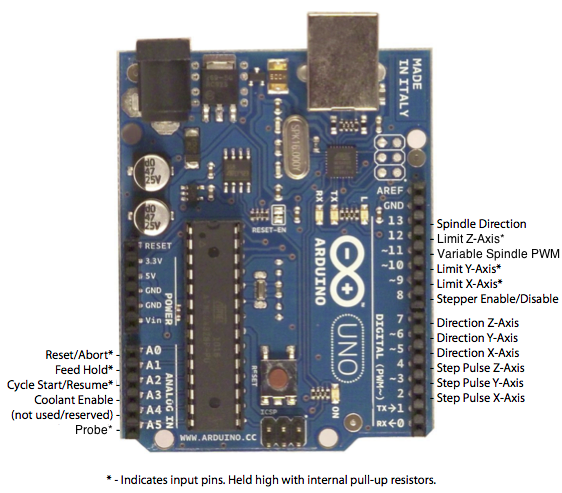 It is a firmware built with the Arduino framework and runs on, you guessed it, cheap Arduino hardware! As you can see, the mapping to my machine was pretty straight forward. Flashing the board with the latest GRBL software was also pretty easy using the Arduino interface. The result is a USB device showing up as /dev/ttyUSB<n> in Linux, which behaves like a serial port and which now accepts G-Code to control my machine – awesome! The hardware part is the part that scared me so many years and it turned out to be solvable with the Arduino Uno board, some wires and a soldering iron. That part was easy. But what I do with the machine now? Or in other words, how do I control the machine from a PC? And worse, how can I draw or model something, turn that into something that the machine will understand and then how do I feed it into the controller? First I wanted to have a software to simply manually drive the axis. After some searching I found a pretty nice graphical user interface written in Python which exactly matches my needs, it is called bCNC, from its homepage: “GRBL CNC command sender, autoleveler, g-code editor, digitizer, CAM and swiss army knife for all your CNC needs.”, here is also a link to the WiKi. Using bCNC you can send G-Code to the controller and also do a lot more, like initializing the machine, manually driving the axis, setting of the coordinate system origin, editing of G-Code etc. It is very capable – almost too capable for my limited understanding of this kind machines. So this may be a word of warning if you want to dive into the world of CNC machine control – it is a rabbit hole! You can very quickly spend days after days figuring out your way. But it can be very rewarding! Once you figured out a workflow that fits for you and your needs you will have an automated machine at hand that will work very precisely for you. So back to machine control, getting used to bCNC and the necessary steps to control the machine is one thing. It took me about a day to configure and setup bCNC properly and also to configure the GRBL controller – switch polarity, maximum stepper speeds, size of working area and most importantly the number of steps per mm. Driving the motor is one thing but you also need to know how far it will move with how many steps. This took me quite a while, basically trial and error measured with a caliper – the solution: 460, my machine seems to take 460 steps for 1mm of head movement (conversely the minimum movement is 1/460mm). The next question was: Now I have a machine, a hardware controller (Arduino Uno), firmware for the hardware controller (GRBL) and software to control the controller (bCNC), how do generate G-Code from a drawing? And which drawing? G-Code is a pretty complex thing. It does not only contain the description of the movements of the head but also a whole bunch of commands to control the machine (motors on/off, tool changes etc.) and also setting up coordinate systems etc. So when generating G-Code this has to be generated as well and with your machine and machine setup in mind. And then there are more nifty things that need to be taken into account. Imagine you want to mill out something, say a simple rectangle. But the milling drill is not indefinitely thin. If you would follow the exact path of the rectangle you would end up with an error of 1/2 of the milling drill diameter. 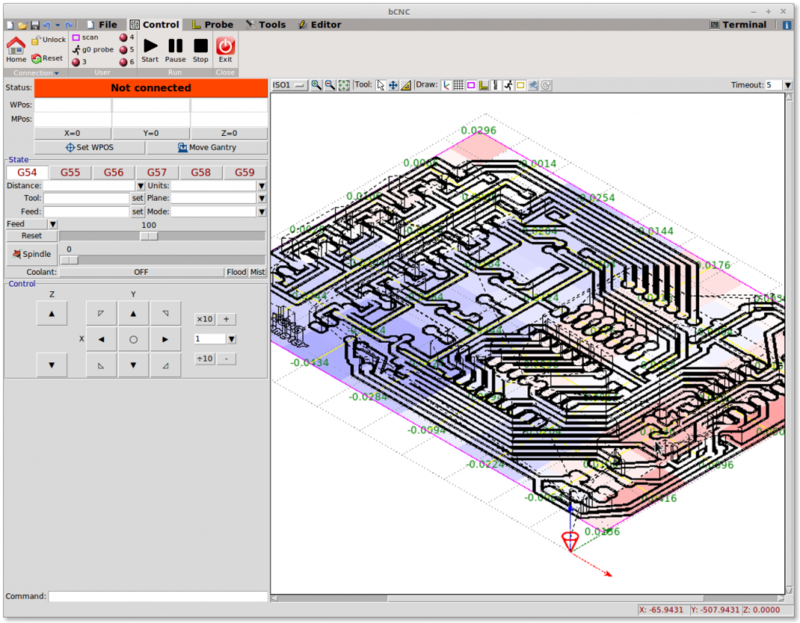 To take this and a lot more into account there is so called CAM (Computer Aided Manufacturing) software which takes your drawing as input, applies different tool and machine parameters and outputs machine readable data that will actually drive the machine – in this case G-Code. It seems that this CAM step is a complex thing. You can usually guess the complexity of a task on the amount of free software compared to non-free software existing. There are quite a number of non-free CAM processors to convert a diverse wealth of input, very often DXF, into machine control, often G-Code. There are also quite some free solutions but most seem very specialized, either just solving the problem of the developer or just for a very specific use case. I am, as of today (January 7th 2019) still looking for the best solution. At the moment the seemingly most capable one I came up with is dxf2gcode (comes with Debian Linux). It has a nice GTK+ user interface. Just that up to now the GCode I generated with it does not really work with bCNC. But this could also be a matter of configuration. At least dxf2gcode runs stable (in contrast to e.g. PyCAM) and seems to offer the most important features I need. PS: If you happen to have the same (or similar) machine I will gladly share all my data, configs etc. with you.